Banks and other financial institutions face a unique set of risks and issues as they manage third party relationships. Specific guidance has been developed by the Office of the Comptroller of the Currency, U.S. Department of the Treasury, and supervisory oversight is expanding. There are key process approaches and technology systems that enable a truly effective third party oversight capability, from initial due diligence and on-boarding through to the management of issues related to relationship termination and everything in between. Our panel of experts will present an interactive discussion of the challenges and solutions being implemented by leading companies today. 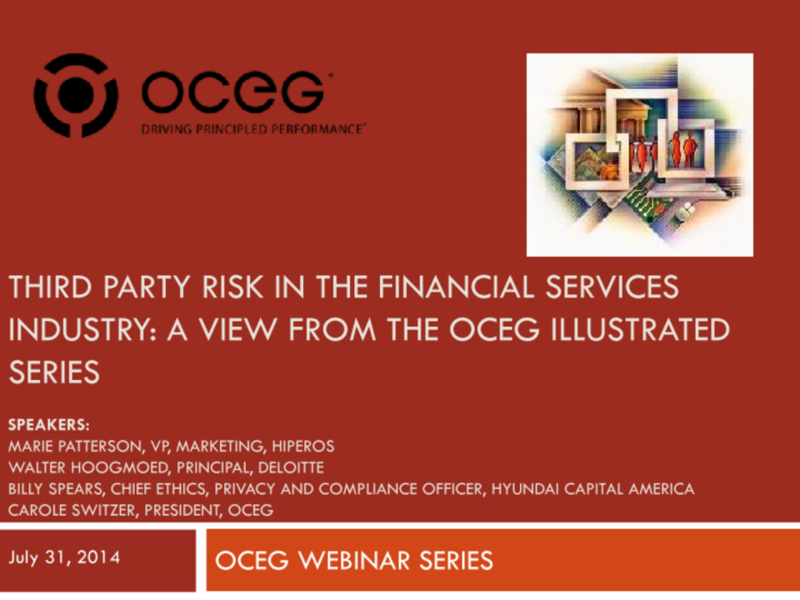 The post Third Party Risk in the Financial Services Industry: A View from the OCEG Illustrated Series appeared first on OCEG. Co-Founder and President of OCEG, a global nonprofit think tank that provides standards, guidelines and online resources to help organizations achieve Principled Performance. We have emailed instructions to access Third Party Risk in the Financial Services Industry: A View from the OCEG Illustrated Series Slide Deck to . Make sure the email arrives in your inbox: either add "support@oceg.org" as a safe sender to your email platform, or if you use Gmail, drag our email into your Primary tab.